London Irish are arriving back into the Premiership knowing exactly how challenging their task is and knowing full well that the majority of people are expecting them to fall straight back down into the Championship come May 2018. There’s no doubt that it’s a tall order to stay up however Nick Kennedy has recruited astutely and despite being a new DOR on the block he is a tremendous leader and exactly the right person to be at the helm for this challenge. While I couldn’t tell you which team will be relegated from this season’s competition I personally wouldn’t put my mortgage on it being London Irish. The days when London Irish shone in the top domestic competition were when they had a powerful pack and one that combined with backs that had oodles of tricks up their sleeves. We’re talking here about the days of Bob Casey and their now DOR in the row, Clarke Dermody, Faan Rautenbach and co up front with the likes of Seilala Mapusua and Sailosi Tagicakibau causing havoc out the back. Of course the game has moved on since then but my point is that Irish need to develop that all court squad, play with confidence and frustrate sides if they are going to secure their place back in the country’s top-flight domestic competition. I mentioned signings a moment ago and making them when you don’t know which league you’ll be playing in until May 24th is a huge challenge - thank goodness that won’t be the case for teams in future seasons. On the evening that London Irish won their final play-off Nick Kennedy was on the phone trying to recruit players and I’d say, given the circumstances, he’s done a pretty good job of it. The important thing for their DOR was to bring in individuals that sured them up in vital areas especially in the pack because we all know that’s where newly promoted sides often get bullied. Petrus Du Plessis and Gordon Reid will add significant experience to their front row alongside the former being a tremendous character to have in the ranks. The Premiership road won’t be plain sailing and to have someone with an energy like his will be vital. Franco van der Merwe didn’t make 73 appearances for Ulster for nothing while out the back Napolioni Nalaga has serious potential to carve up in the competition as well as inspiring someone like Joe Cokanasiga at the same time. Alongside these new names Irish will need their existing squad members to embrace the jump back to Premiership level and grab their individual opportunities with both hands. This season young players that have turned heads before must do so again with Alex Lewington and Johnny Williams being two and as collective they have to squash people's expectations of them and do so from the word go. The club's first six games are pretty horrendous including Exeter and Leicester Tigers however by hook or by crook early scalps must be made to sure their footing in the competition. Twickenham Stadium isn't a quiet and unasuming place to mark your return to action so embracing the occasion London Double Header will be part of the Round 1 mix for the Exiles. Do we know if they're going to be ready come Saturday afternoon? Well no. Pre-season matches can give an indication but until the 23 play for a full 80 minutes both we, and their management team, won't know the true level that they're starting at. 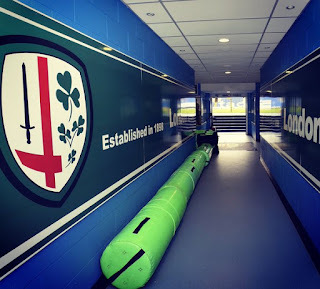 At full time on Saturday evening this positive reflection on London Irish’s return may look to have been off the mark. But right now, without a moment of the Premiership season having been played, they have done their utmost with the hand that they have been dealt to be ready. The final team coming through the play-off system is always going to be at a huge disadvantage and if Bristol return next season - with promotion secured by mid January for example - then their task of retaining their place will be an altogether different beast. Over the next 22 rounds of rugby the expectation isn’t for London Irish to push about the big dogs, we’re talking your Saracens or Exeter Chiefs here, however there are teams to be picked off and upsets to be had if they rise to the challenge as a collective. If they don’t or if they have a torrid time with injuries then the next nine months will be tough due to the relentless nature of the competition. The challenge is a huge one but I personally hope to see London Irish standing up and being counted for over the coming months. Opening Six Matches: Harlequins (Twickenham Stadium), Exeter Chiefs (A), Sale Sharks (A), Northampton Saints (H), Newcastle Falcons (A) and Leicester Tigers (H). Challenge Cup Group: London Irish, Krasny Yar, Edinburgh Rugby and Stade Français Paris. Key Player: Ben Franks. A fit Ben Franks will do wonders for London Irish as well as keeping an eye out for the aforementioned Napolioni Nalaga getting to grips with Premiership life.